Autograph Letter Signed ('Wm. Gourlie Jr.') to 'Mr. Ward'. 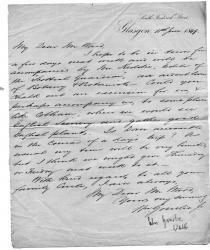 18 June 1849; on letterhead of South Frederick Street, Glasgow. 4to, 1 p. Sixteen lines of text. Clear and complete. Neatly written in copperplate. On lightly-aged and creased paper, with one 4 cm vertical closed tear (through one word) along fold. He will be 'in town [i.e. London] for a few days next week and will be accompanied by Mr. Keddie, Editor of the "Scottish Guardian", an ardent lover of Botany & Botanists'. Asks if Ward can 'chalk out an excursion' for them, '& perhaps accompany us, to some place like Cobham [regularly visited by Ward], where we would see English Scenery, and gather good English plants'. He wonders whether Dover is accessible from London 'in the course of a day's trip'. 'As usual my time will be very limited, [...]'.